Pottstown: Time for the full-court press? The article about Danville, PA that we just added to our Revitalization Library got me thinking about very specific actions that Pottstown might want to consider now. Why not take the $45,000 remaining after painting the Mrs. Smith’s building brick red and apply it to QUANTIFIABLE & VISIBLE ACTIONS to improve Pottstown’s downtown? High Street is THE face of Pottstown. People take one look and make a snap judgment, maybe without even getting out of their cars. Pretty soon High Street is going to be beautifully illuminated. Now is the time to press any advantage to be gained from that, coordinate resources, and put out a blitz of tried-and-true downtown economic development strategies. 1) I’ve heard from several sources that there was a downtown site inventory/survey started or completed as follow-up to the Economic Development Strategic Plan. Where is it? Resurrect & update it. Find a simple, clean, attractive, inexpensive way to create an online database with key information about vacant properties that are available for sale or rent; allow for uploading of photos. Call upon Montgomery County Community College’s new urban planning students to help with site inventory and in getting additional info from local realtors and the county’s property records database. Input the data and unveil a new downtown district marketing tool via PDIDA’s website. 3) There is this wonderful resource for new and existing business owners right in the New York Plaza building at 244 High Street: SCORE. They’re a non-profit business mentoring association that gets funding from the U.S. Small Business Association. Four times a year they offer a workshop seriesto help with all aspects of running a business. They offer other courses as well, all of which are taught by experienced professionals who volunteer their time to share their knowledge. Use some of the $45K to fund partial scholarships for new Pottstown-based businesses and nearly-full scholarships for existing business owners. 1) Here’s our downtown property inventory; we want to help you find the space that works for your business. 2) If you have a solid business plan, we will help with the rent during a pre-determined start-up phase. 3) We help promote all our businesses. 4) We will fund training workshops and introduce you to a network of business professionals to help you succeed. 5) By the time the 2011 First Saturdays start up again, there will be a VISIBLE difference in the downtown. 6) By coordinating the expertise already in the community, we can make $45K go a long way. High Street is how the outside world judges you.At some point, you gotta put on your full-court press. There are so many lessons here that could be immediately applied to Pottstown’s revitalization. 2) Tap Montco college students for discrete planning and community development projects and give those students real-world experience. Thanks again to Andrew for this informative, idea-packed article! Like Pottstown, Wellsboro PA (in Tioga County along Route 6 of Pennsylvania’s northern tier) was built on, and because of, industry. Early in the 20th Century it served as a shipping point and trade center, with businesses that included fruit processing, flour and woolen mills, and much more. But as they did in Pottstown, eventually those industries moved out. The departures forced the borough to change. Because it is only 10 miles from Pine Creek Gorge, the natural wonder known as “the Grand Canyon of Pennsylvania,” two of Wellsboro’s thriving industries are now tourism and retailing. The length of its downtown is small in comparison to Pottstown’s but, also in comparison, far more robust. Shops are well kept, busy, and open late. The merchandise selection is diverse. Several excellent restaurants can be found within a two-block walk. 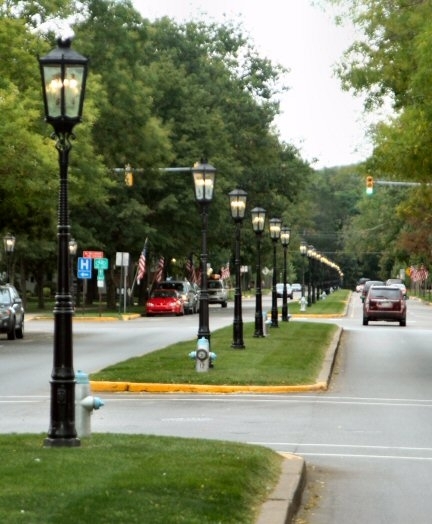 And the lanterns that became a fixture of the boulevard-like Main Street coursing from east to west through Wellsboro add to its ambiance. They burn from mid-afternoon long into the night. Photo by Joe Zlomek: Simulated gaslight lanterns burning Saturday (Sept. 4, 2010) at 4 p.m. on the west end of downtown Wellsboro PA.